You may have noticed my daily Wrapunzel posts haven’t been so daily lately! Between much travel (all for simchas, thankfully!) and setting up The Wrapunzel Store (which will be opening Gd willing in 1 1/2 weeks – ahhhh! ), I have been tad overwhelmed. I also had to get a new computer and lost access to my photos, but that’s another story! Rest assured, as soon as this preparation phase is over, I will be back and posting as much ever. There will be a very exciting Lady Wrap Star featured tomorrow and I am receiving even more zig zag criss cross photos from different ladies!! Right now I would love to share with you a photograph from our photo shoot yesterday! 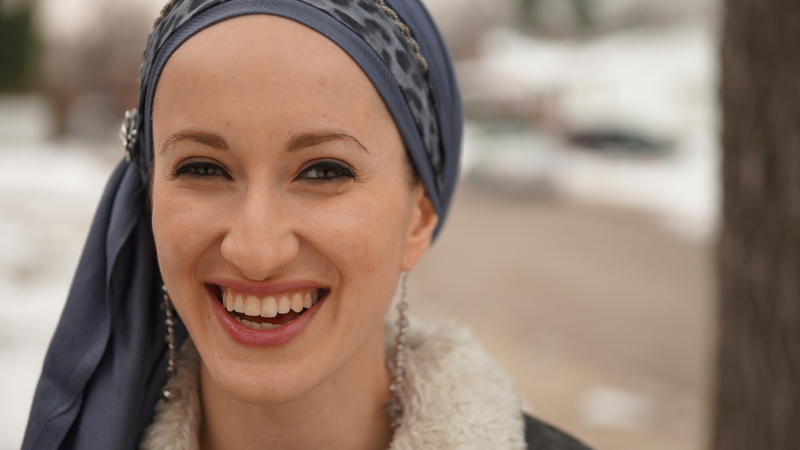 It was super cold outside but with this gorgeous tichel I was smiling brightly! Love you all SO very much! Thank you for all your support in this new venture. This is ALL for you!!! Very pretty! So excited about your store! I can hardly wait. Well done Veera, that is very good for your first attempt. Welcome to the Wrapunzel community. Looks great. I was really struck by that colour. Thank you! It’s such a soft colour and I was skeptical at first… but it works really well on me! It might work on you too! Really, really nice! Grey is such an underrated color, and I’m so glad you show-cased it. It sounds like we fell into the “need a new computer” boat (or off the “need a new computer” cliff, more like) at just about the same time. I hope your new one treats you well! Amen!! Same to you! My battery literally melted out of my other one so I was using it as a desktop… and then it just started, well, suffering greatly. It had a great life, at least. Very classy & great smile. Nice color for a pretty winter scene. That’s a “pick-me-up” pic! (One that makes me smile!). It seems to reflect the treasure of joy from within!